The "L"'s original rolling stock, including both trailers and motor cars (and multiple unit, or M.U., when it came into use) were wooden. Of course, at this time, each of the four lines (South Side, Lake Street, Metropolitan and Northwestern) were separate companies with their own fleet of passenger cars, locomotives (before 1900) and work cars. They were, however, all pretty much the same, using the basic footprint adapted from the railroad coaches of the day. Later, when the lines were consolidated under the Chicago Electric Railways Collateral Trust (CER), the cars were renumbered and each of the company's cars assigned to the various divisions. Right: South Side Rapid Transit trailer number 40. Note: Between 1897 and 1900, the majority of cars 1-180 (150 total) were converted to M.U. control. Note: All locomotives were built by Baldwin. Locomotive 41 at South Park Ave. (King Drive). The Chicago & South Side Rapid Transit (the company's original name) was the first "L" line to open in Chicago, setting the stage for those to follow. These were the days before third rails and multiple-unit control, so in January 1892, an order was placed with the Baldwin Locomotive Works for 20 Vauclain four-cylinder compound locomotives of the Forney type and, in mid-February, with the Gilbert Car Co. of Troy, NY and the Jackson & Sharp Co. of Wilmington for a total of 180 trailer coaches. Later that year, 26 more locomotives were ordered. On May 9, the locomotives were tested on the South Side's line between Congress and 39th Street. Regular passenger service started may 27, 1892. Car 33 was rebuilt in 1897 by Pullman and was able to seat 56 passengers. It isn't clear whether all South Side cars could seat 56 passengers or if that was a result of the conversion. In 1898, the South Side Rapid Transit converted to electric traction, allowing the cars to be run over a charged "third rail". Of course, all the SSRT's cars were just trailers, so some of trailers had to converted to motor cars until new units could be delivered. April 20, the first 20 cars were put into service. (Unfortunately, that night, 17 were withdrawn due to defective rheostats. It was soon corrected.) By July 27, the conversion process was complete. The company saved a great deal of money not having to by coal and maintain the locomotives. The advantages of multiple unit control were highlighted on Jubilee Day, October 19, 1898 (celebrating the United States' victory in the Spanish-American War), when the Loop was flooded with people. Streetcars were banned from the business district. The "L" handled 367,000 passengers that day, with the South Side alone hauling 129,000. That never would've been possible without M.U. SSRT car 1, the very first "L" car, has been preserved. Click here to learn more. 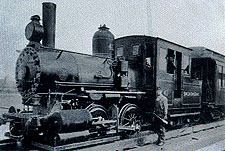 Right: Locomotive 10 (the Clarence A.) and Coach 7 pose at Oakley Avenue in the summer of 1893. Note: Fifteen cars from 1-100 were converted to motor cars in 1896-97 and renumbered 126-138. 101-125 were similarly converted in 1896. Car 2234 was obtained from the Chicago City Railway in 1908 and numbered under the system of the CER. 1 2934 1893 Elizabeth W.
2 2935 1893 Harriet E.
3 2936 1893 Marietta T.
4 2937 1893 Louisa C.
5 2938 1893 Lizzie A. 8 2941 1893 John H.
12 2955 1893 Daniel W.
15 2958 1893 Paul B. 18 2961 1893 William P.
21 2964 1893 James C.
Note: All locomotives were built by the Rhode Island Locomotive Works. During the spring of 1893, the Lake Street "L" placed an order with the Rhode Island Locomotive Works for 10 vacuum brake-equipped Forney steam locomotives, delivered that July. Pleased with their performance, an additional 15 were quickly ordered in addition. Each one was numbered and named in honor of a company officer, family member or investor, using using the first name and middle initial. In late 1894, another 10 were ordered, but these were never named. Concurrent with the first order, two orders for passenger trailers were placed with the Gilbert Car Manufacturing Co. of Troy, NY and the Pullman Palace Car Co. The Gilbert order was increased to 100, making a grand total of 125 cars. They were all painted Tuscan red and stenciled with the Lake Street's name. Passenger service was inaugurated November 6 at 5am between Madison & Market and California, with service extending west as stations and infrastructure were completed. 50,000 people rode on the first day. In 1895, to minimize costs (which were bankrupting the fledgling company) and keep up-to-date, it was decided to change the Lake Street "L" to electric traction. Due to the lack of funds, 30 existing coaches were converted to motor cars, with operating cabs, motors, controls, lighting, heating and other auxiliary systems installed. They were randomly drawn from the fleet and renumbered. At this point, the cars' vacuum break systems were replaced with compressed air brakes. The next two orders would be for new cars already equipped to haul trailers. Right: ACF-built Metropolitan car 842. 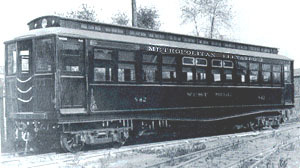 Note: The Metropolitan's cars were the first to be equipped with M.U. for the start. Funeral car 802 receives a casket at the Laflin St. station, one of only two equipped with a casket elevator. 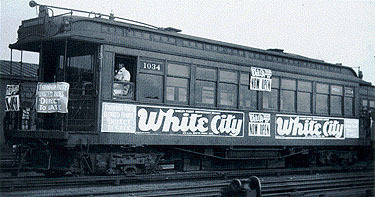 The Met's construction company, the West Side Construction Co., was in charge of procuring the line's rolling stock. Originally, they'd placed an order for 60 steam locomotives with the Baldwin Locomotive Works and 250 passenger cars. In May 1894, the contract was changed to substitute electric traction as the method of propulsion. This decision followed the successful use of this type of power for the Intramural Railway at the World's Columbian Exposition. This change saved an estimated $250,000 for the company. Barney & Smith Car Company of Dayton, OH was contracted to supply 55 motor cars (cars 701-755). The order with Pullman Palace Car Co. for 100 trailers remained. The rolling stock was painted a dark green referred to as the standard Pullman sleeping car color. This decision made the Metropolitan the first "L" in Chicago to run off a third rail (and the first to do so from the get-go). In mid-1904, the Met began converting its rolling stock to multiple unit control. This was no small task, because control systems had to installed in 88 motor cars and 262 trailers had to be wired as well. In July, the first converted trains entered service. The the first decade of the 20th century, the Met decided to go after an untapped passenger market: the dead. Due to the poor condition of the roads leading to and around the west suburban cemeteries, the Met began to run funeral trains. Jewitt-built car 802 was converted for this purpose, having its advertisements removed and dark green carpet and curtains installed. A window on each side of the car was modified to receive the casket. The Met's success with this service prompted construction of a new branch directly into Oak Ridge and Mt. Carmel Cemeteries and the Aurora Elgin & Chicago RR's entrance into a partnership with the Met to run the service. By October, 1907, they were running an average of 22 funeral trains a week. The meet the increasing demand, the Met rebuilt car 756 specifically for the purpose, with elegant interior decorations and even a lavatory. In 1932, the AE&C dissolved their agreement with the "L" (now under the control of the CRT) and funeral service ended. By this time, it had became unpopular anyway and by 1934, the AE&C discontinued it too. 756 was renumbered 2756 in 1913 and in 1922, was converted into a mobile medical examining station. It was scrapped in 1953. Interestingly enough, the CTA 's charter allows it to run funeral trains, though this clause has never been exercised. Right: Northwestern 1034 (formerly 34) near 61st Street after the startup of crosstown service. The "White City" banners are ads for a popular south side amusement park. Note: Equipped with air-operated doors, cars 280-299 were converted to motor cars in 1913 and renumbered 1789-1808 under the numbering scheme of the new CER. In stark contrast to the continuous problems that plagued the construction of the Northwestern's infrastructure, the ordering and receiving of their rolling stock went off without complication. The cars, some of the handsomest ever used in Chicago, were painted Pullman standard green. By early December 1899, a few of the cars had been delivered via a temporary ramp constructed at Irving Park Road where the "L" veers off from the Chicago, Milwaukee & St. Paul RR's tracks. The rest were delivered to the Lake Street line, where they were stored until the Northwestern was complete. When the Northwestern extended their tracks north of Wilson in 1908, they used the grade-level right-of-way of the St. Paul's tracks. Their franchise forbad the used of a third rail on the ground for safety reasons (although it was used elsewhere in the city). So, the rolling stock had to be equipped with trolley poles to run off overhead wires. 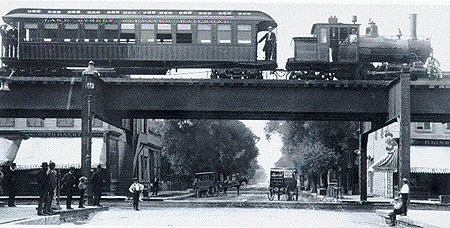 The Evanston branch also ran off overhead wire (doing so until the 1970s, in fact), but the Evanston City Council required the tracks be elevated by 1910 as part of the franchise agreement. The overhead wire also allowed the North Shore Electric's rolling stock to run over the line from 1925 to 1963. As soon the South Side Rapid Transit had opened in 1892, civic and business leaders began talking about unifying the "L" lines under a single management. Various attempts were made for the next two decades and Charles Yerkes' ownership of three "L" lines (the Lake Street, Northwestern and the Loop) was a precursor (although he kept the three entities separate). However, by 1913, the effort was finally a success. Under the chairmanship of utilities magnate Sam Insull and the presidency of former-Met president Britton I. Budd, the CER (Chicago Elevated Railroad Collateral Trust) was not really a corporation, but rather a "voluntary association". The four "L" companies kept their separate identities until the CRT took over in 1924. The CER consolidated the rolling stock and worked out an new numbering system (since all four "L" companies began numbering their rolling stock with "1" and worked up). The South Side cars kept their numbers and represented series 0-999. The Northwestern added 1000 to each of their numbers (34 became 1034), creating the 1000-series. The Metropolitan's added 2000 to their numbers and the Lake Street's added 3000 to their numbers, eliminating duplication. The cars all kept the markings of their original "L" companies, but were reassigned around the system. In fact, Northwestern cars spent a great deal of time in Lake Street service (both had sections that required overhead trolley wire due to grade-level running). Over the years, both before and after the CER took over, the wooden cars were upgraded. Improvements included enclosed (instead of open) platforms, sliding (instead of folding) doors, electric (instead of coal-fired hot water) heaters and reversible (instead of fixed) transverse seats. The application of intake and exhaust ventilators made possible the adoption of the plain arched roof, eliminating the leaky ventilator sash. Steel-reinforced underframes had been included in cars built after 1904, although the basic construction material was wood. Over the years the underframes of a number of all-wood cars were similarly rebuilt. The wooden cars were amazing in that they remained in service long after their predicted service life had passed. The later of the wooden cars remained in regular passenger service well into 1950s, over fifty years after they were delivered. Still, the CTA was eager to retire the aging fleet of wood-steel cars. As a matter of fact, as early as the 1920s, the CRT had been under pressure from various groups to replace the cars with new all-steel models. (The CER and CRT would acquire 455 all-steel 4000-series cars, but this represented only about 1/4 of the total fleet size.) In addition to providing a hazard on the largely unsignaled lines (see the Granville Wreck for more on the hazards), the cars were simply technologically obsolete, representing the years when electric transit was in its infancy. When the State Street Subway opened in 1943, the City of Chicago and CRT agreed that only all-steel cars would be allowed to operate in it, with wooden cars posing too much of a threat in case of a collision (plus, they wanted to show off the newest cars in the brand-new subway). However, at least two non-work motor woods did make it into the subway. When the 6000s were taken down into the Milwaukee-Dearborn subway for publicity photographs, a two-car train of ex-Met open platform cars (2720 and 2745) went down there for "protection". When the 6000-series PCC cars were under design, CTA engineers started working out ways to maximize use of the existing fleet of wood, wood-steel, and all-steel cars. Identified for early action was the retirement of all wood-bodied trailers to improve safety and performance. Introduction of A/B service was one way that the slower wood cars' use was improved. The wooden trailers were also retired as quickly as possible. However, a few of the best trailers - those with air engine doors - were motorized using truck, motor, and control components that had been in storage for more than twenty years. Still, as the 1950s went on, more 6000s were delivered, and more short branches were abandoned, the wooden cars were systematically retired as fleet requirements allowed. Ex-Met wood cars finished out the service by wood cars on the Ravenswood, the Stockyards and the Kenwood lines. The South Side branches last ran with cars from the 2858-2927 series. On the last days of the Kenwood, all of cars were numerically above 2900. The Ravenswood required more cars, so there were probably 2790-series cars still running up until the end on that particular line. The Evanston line, of course, had to run with trolley-pole equipped cars, and so 1700/1800 series cars finished up on that line. For some reason (perhaps it depended on whether the cars had GE or WH equipment - the maintenance department was pretty loyal to WH at the time) the ex-Lake Street 3100s went into storage earlier. Several of there 1100 series former-Northwestern cars were laid up at Laramie on the Garfield Park line in 1954; some ex-Lake Street equipment may have also been there circa April of 1955. Other north side trailers were stored at Wilson Lower Yard, pending disposition. The last day of wood car service came on December 1, 1957 with the closure of the Kenwood Line. 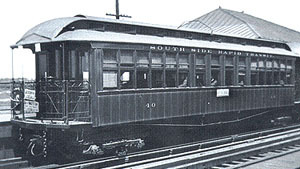 SSRT car 1 has been preserved by the CTA and was restored to near-original condition in the 1960s. The car was last taken onto the system in 1997 for the 100th anniversary of the Loop Elevated. Since that time, due to its age and fragile condition, it has been kept in storage at various rail maintenance facilities. In 2005 or 2006, the CTA will donate the car to the Chicago History Museum as part of a large-scale renovation of the museum. The car will be housed on CHM's second floor surrounded by a recreation of an 1893 South Side elevated station platform and visitors will be able to enter and look around the car. Car 1 and the station will serve as the starting point to the completely revamped galleries on Chicago. For photos of Car 1's move to the Chicago History Museum and its exhibit there, see our Car 1 at the Chicago History Museum gallery.